The latest Humble Bundle is pretty darn awesome. Named the Humble Revelmode Bundle (because it’s organised by YouTube chap PewDiePie’s “creator network” Revelmode), this collection gathers the likes of Nidhogg, Spelunky, Golf With Your Friends, Roguelands and Rocket League all in the one place via the familiar tiered payment format. Robot Roller-Derby Disco Dodgeball, Choice Chamber, and Nidhogg—the latter of which we described as a “brilliant marriage of mechanics, level design and music”—all befall the pay-what-you-want premier tier; while paying above average (£4.86/$6.45 at the time of writing) also nets you the Early Access-dwelling Golf With Your Friends, Skullgirls and a bunch of its DLC, Roguelands, and the wonderful rock shelter-swiper Spelunky. 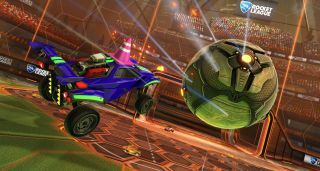 Psyonix's formidable car-ball-cage 'em up Rocket League can also be yours on top of all that, so long as you’re willing to fork over £11.30/$15. As always you’ve got the option to split your dough between the game creator’s, Humble itself, and a selection of charities. The Humble Revelmode Bundle is live now and runs until July 26.